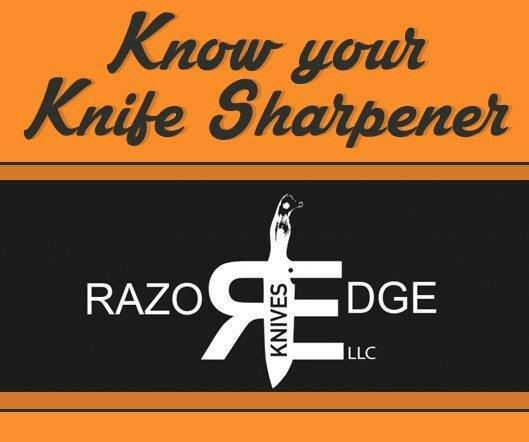 Here’s our second interview of our new series: Know Your Knife Sharpener. Today we have the pleasure to know more about Josh, from Razor Edge Knives. I ‘sharpened‘ knives as a kid on a diamond stone – still remember the name of it. It was the EZE-Lap diamond stone. Not that I was able to really get it sharp but I think that’s where it all started… a cheap pocket knife and a diamond stone when I was a kid. Been intrigued with sharp knives ever since! Well, I (for whatever reason) asked for a Spyderco Sharpmaker from my wife one year as a Christmas present. I began using that but soon realized it is no good for reprofiling edges (which most need). So then for a gift later I had done a lot of research and asked for an Edge Pro Apex. After I got that I realized that I could get a knife REALLY sharp so I just put it out there on Craigslist, and slowly began building my business: Got a website, cards, listed my business on google, upgraded equipment, etc. The Lord has seen fit to bless my business such that, 5 years later, I am full time now doing what I love! I now offer a mail-in sharpening service nationwide as well as sharpen locally. I use several techniques and pieces of equipment to sharpen and modify knives… There is no “one best” approach as each situation demands different ways to approach the solution. I use a variable speed 2×72 professional belt sander for reprofiling or regrinding a knife, but then I can finish it or fine tune the edge on the Wicked Edge. The technique I use is to develop a burr on both sides of the edge then remove the burr in various ways for a clean, burr free apex. I have also developed a way to sharpen or even grind serrations into a knife edge. All of my powered equipment has been converted to be cooled with a coolant during the grinding process to prevent temper damage – this is something many professional sharpening services overlook to their detriment. That’s a hard question because I am always learning and developing my technique further. But it wasn’t hard to get a sharp edge on a knife with the right equipment from the beginning, it’s the rest that is difficult: making sure you don’t have a wire edge, making the bevel look good (nice and even, with consistent grind lines), being careful to not remove too much metal on powered equipment, learning the process of applying a mirrored edge, etc. Learning to develop a burr and remove it so I was sure that I had truly apexed the edge. Yes, I would say it is. As long as it has been heat treated and tempered then it is a great idea. The sharpening fundamentals do not change, no matter the steel. It may just be more difficult to master on cheap knives that have a difficult burr, but you are not damaging your expensive knives which is the positive to this. Not going far enough or using a coarse enough stone (by hand/manually), or conversely, grinding the knife edge into oblivion (on powered equipment). Both of these are related to inexperience and will come with time – but that’s why cheap knives are great practice knives because you aren’t scared to mess them up. Customs. They are expensive, nerve wracking, and because of the time I kind of lose money. Just one more thing to offer.